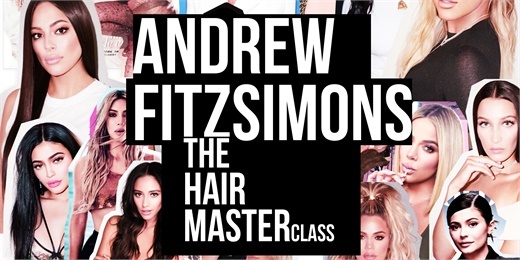 With more than 20 years of experience in the industry, Fitzsimons is combining his interests, expertise and inspiration to launch his new masterclass series, ANDREW FITZSIMONS: THE HAIR MASTERclass. You have seen celebrity stylist Andrew Fitzsimons' work on the likes of the Kardashian-Jenner clan, Shay Mitchell, Ashley Graham and more. Or, you know him as a brand ambassador to Alterna Haircare. With more than 20 years of experience in the industry, he is combining his interests, expertise and inspiration to launch his new masterclass series, ANDREW FITZSIMONS: THE HAIR MASTERclass. This will be the first masterclass series Fitzsimons will host in the U.S., beginning with its inaugural event February 18, 2019 in Los Angeles, geared toward salon stylists, freelance artsits, salon owners and beauty enthusiasts who want to learn a few tips and tricks for at-home styling. On social media, with his nearly 260K followers, he tells MODERN SALON he has been asked for a while when he would do a masterclass, which piqued his interest. With that in mind for a few years, and after his first international masterclass in Manchester, U.K. with Beautyworks, it solidified the itch for him to launch his own here. Fitzsimons wants The Hair Masterclass to be different than a "typical" beauty class. THE HAIR MASTERclass be a five hour event featuring four segments: The Journey, during which Fitzsimons will share his nearly 20-year career story; The Looks, a traditional look and learn including his most-requested looks and tips and tricks from the red carpet; The Panel, a discussion between beauty experts on the evolving industry and The Future, a talk from Fitzsimons on the future of beauty and the importance of philanthropy. "As an artist, it’s always important for me to put my own spin on all the work I do," Fitzsimons tells MODERN SALON. "I’ve drawn inspiration from a lot of places, so you can expect part Fashion Week, part TED Talk, part career workshop…all in a very inclusive environment." Inclusivity is a huge focus of the masterclass, as it is in Fitzsimons' personal life. If you are following him on Instagram, you know he is a vocal supporter of numerous causes, ranging from political topics to human rights. "It’s hugely important for me to be contributing to the beauty community in a positive way," he adds. "Beauty comes in all shapes, sizes, gender identities, skin colours, hair textures, so you’re going to see that on stage." Additionally, last year, Fitzsimons launched the Trans Cosmetic Donation Program in partnership with the L.A. LGBT Center. Upon attending The Hair Masterclass, attendees will be urged to bring their unwanted, unopened cosmetics and personal hygiene products to be donated to the center. Fitzsimons is also working with the event sponsors to set up monthly donations to the program. The Trans Wellness Program will also have a presence at the event; it’s important to Fitzsimons that trans people are included in the beauty conversation. Zoe Hyams, Vice President of Marketing and Public Relations, chats about all things new and fabulous at Keratin Complex, including new imagery, packaging, and some exciting freshly launched products.